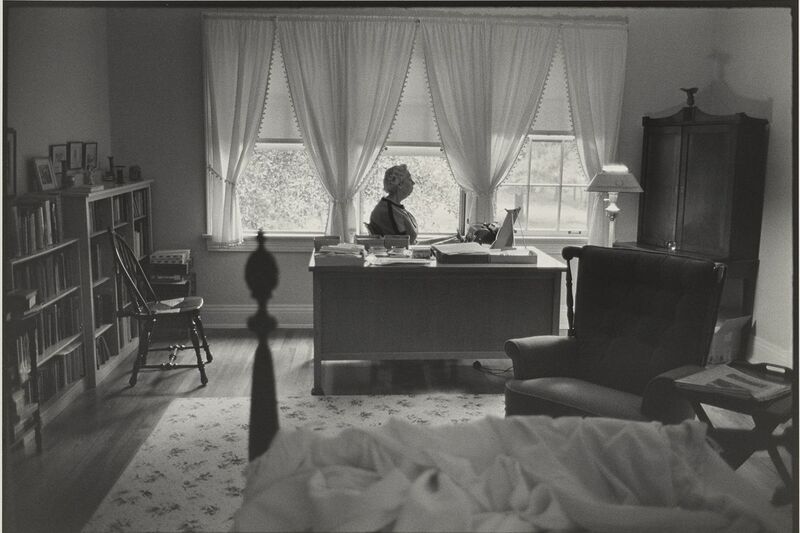 One of the most memorable images in the "Face to Face: Portraits of Artists," a photography show at the Philadelphia Museum of Art through Oct. 14, shows the writer Eudora Welty at work. In Jill Krementz's 1972 photo, we see the writer, in profile, sitting at a large desk, facing her typewriter. Behind her are three windows, whose starched white curtains are fiercely tied back. In the foreground, we see what is presumably her bed. There is something impersonal about the photograph. We don't see Welty's face very well. She could almost be a marble bust, rather than a real woman. We infer something of her personality from the genteel precision of her surroundings, but she is not trying to engage the viewer. Yet it is also a very intimate picture. We seem to be seeing a large part of her world, the focus of which was the silent, solitary, physically unimpressive act of writing. It's the most mysterious and private thing she did, and it's the reason we are interested in seeing her. Welty's is probably the most reticent image in "Face to Face," a selection of more than 100 photographs of artists, writers, musicians, and other creative people from the Art Museum's collection. More often, artists seek to communicate glamour, mystery, genius, or mischief. In the celebrity-driven culture that has grown up in the last century or so, careers can depend on knowing how to strike a pose. Thus, we see the many faces of Georgia O'Keeffe — fragile, dominating, masculine, and feminine. There is Frida Kahlo, bare-breasted, and a photo of another woman wearing her clothes. There is Marcel Duchamp hanging out with other artists, playing chess, and in Bert Stern's wonderful 1967 photo, blowing a great quantity of smoke from his mouth. Sometimes, the pose is unexpected. For example, an early 1930s photograph of Aaron Copland by George Platt Lynes shows the composer, looking down and to the side, apparently lost in thought. His arms are crossed unnaturally, and his elbow rests on what appears to be leopard skin. There is something high camp about this image — Copland looks just a little too self-consciously artistic, and that leopard skin is way over the top. But what's most surprising is that it seems to be off-brand for a great advocate of Americana in music. Actually, Copland hadn't yet written Appalachian Spring or Billy the Kid when the photo was taken. Though Copland was past 30, it is a portrait of a composer who had not yet found his voice. The show, organized by Peter Barberie, the Art Museum's chief photography curator, does not provide either history or analysis of how artists presented themselves to the camera, or how photographers have depicted them. Rather, it is a selection from the museum's holdings, whose labels provide minimal information about the subjects and next to nothing about the photographers. Some are little more than old and interesting snapshots, not taken for any artistic or promotional purpose. (Some of the prints are smaller than the photos on your phone. Reading glasses may come in handy.) Most, though, aspire to be art, or at least about art. The show serves, in part, as a supplement to the "Modern Times" show in the gallery next door, since some of the same artists — especially O'Keeffe and other artists associated with the photographer and gallerist Alfred Stieglitz — are prominent in both. >> READ MORE: Inquirer art critic Tom Hine's review of the "Modern Times" show. Stieglitz's greatest strength was probably his ability to appreciate and willingness to promote other artists. As a photographic subject, he seems to radiate a geeky generosity that seems to explain a lot about his central role in the art of the early 20th century. The exhibition also connects with other strengths of the museum. There are, for example, a number of pictures by and of Thomas Eakins, including a set of nudes and a wonderful photo of him hanging out in his studio with some other local artists and a big dog. And then there are all those Duchamps. It also highlights some major holdings of the photographic collection. Most of one wall is dominated by the work of Arnold Newman, the subject in 1945 of the Art Museum's first photography show, "Artists Look Like This." Newman sometimes placed artists in settings that suggested their work. Edward Hopper, for example, is glimpsed through a doorway into the next room. Piet Mondrian is in a room where he's the only thing that's not a rectangle. I prefer the examples in which Newman is not so gimmicky. It might have been tempting, for example, to show Stuart Davis against a lot of signs. Instead, he looms in profile, against a shaded window. Charles Sheeler, posed against a tile wall, seems a small-town man with a far-away look. The largest group, though, is of work by Carl Van Vechten, the Iowa-born writer and critic who celebrated the emerging African American urban culture in Harlem in the 1920s. Although he was criticized for what would now be called cultural appropriation, he was an assiduous documenter of mid-20th century culture, with a special emphasis on black and gay artists. The Art Museum holds more than 1,500 of his photographs. Some of them are wonderful. In a 1955 portrait, a young Alvin Ailey is plainly dressed and mostly in shadow. But his graceful hauteur communicates that he is a dancer. Of course, if you don't already know that Ailey was a choreographer, dancer, and founder of an important dance company, the photograph might not have the same impact. What we get out of these images of artists and performers in this show depends largely on the knowledge we bring to them. One of Van Vechten's oddest images is Billie Holiday with Her Dog Mister (1949). In it, the singer is lying on the floor, her head facing left, with eyes toward the camera. Her left arm is wrapped around the body of a very powerful looking dog who is facing right, but also has eyes toward the camera. There seems to be more here than a singer and her pet. Should we be thinking of Holiday's history of relationships with abusive men? Is she saying she needs protection, or is Mister only a dog?